Magnetic bead suspensions will eventually sediment and aggregate over time. If non-homogeneous biomagnetic separation conditions are used, studies show that the likelihood of irreversible aggregation occurring is very high. Unfortunately, when this happens, lot consistency, lot quality and lot functionality are all compromised. There are several steps during the preparation of magnetic beads for diagnostic kits where irreversible aggregation can become a problem unless resuspension techniques are used that guarantee gentle disaggregation. 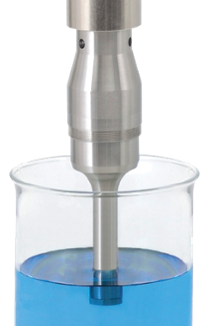 Resuspension techniques include vortexing, roller bottle mixing, overhead mixing, magnetic stirrer mixing and sonication. However, many of this techniques don't have great success at breaking particle aggregation on their own. Of these five techniques, only the sonication method can break apart irreversible aggregates that have formed during the biomagnetic separation process, although sonication should always be used in conjunction with homogenization/mixing techniques. If you did not completely block the exposed hydrophilic bead surface, the chance of your beads self-aggregating increases. Understanding what agent is best used to block the entire surface of your beads is crucial to avoiding this type of aggregation. There are many available blocking reagents and, depending on your ligand and bead surface properties, you must choose the one that is optimal for your system. If you do not follow the proper protocols after each processing step to wash and rehomogenize the beads, aggregates will only accumulate over time and change the dynamics of how the beads are separated. If you apply excessive magnetic force over long periods of time in the retention area during the separation process, electrostatic forces that normally keep the beads separate from one another can be overpowered by the magnetic force, causing serious problems with clumping. Homogeneous biomagnetic separators can help prevent this from happening. Especially in non-homogeneous biomagnetic separation methods, irreverisible aggregation is one of the major concerns during the preparation of magnetic beads for diagnostic kits and other applications. It is an unfortunate fact that aggregates can introduce a high degree of variability and inconsistency in the end product. When aggregation is unavoidable and cannot be resolved with standard mixing or homogenization, the sonication method becomes the preferred choice to overcome the attractive forces holding the clumped beads together. You must choose the proper sonication probe that is optimal for both the volume of the vessel and the sonication intensity desired. You must optimize the depth of the sonication probe in the vessel. The operator must make sure that the temperature of the suspension remains stable during sonication, especially in small volume vessels. This is a critically important point to consider since very high temperatures can ruin the biological functionality of your beads. Repeated short cycles of mixing and sonication are preferable over long sonication times in order to avoid temperature fluctuations and sedimentation problems. And finally, the sonication probe must always be kept clean to avoid cross-contamination. The necessity for the probe to be in direct contact with the sample (thereby increasing the likelihood of cross-contamination). The probe design is always specific to the type of vessel and will not translate or extrapolate to different vessel sizes and shapes. A probe that is extremely efficient for one vessel can be very unreliable for a different vessel. Sonication reproducibility is very tricky. Even with all things being equal in a sonication reaction, small differences in temperature, probe position and volume can affect reproducibility. Microstreaming is typically found only near the probe, so it is important to keep the beads in suspension with mix-sonication cycles. The best solution is to avoid irreversible aggregation in the first place by making sure your beads are sufficiently coated and by using homogeneous biomagnetic separation techniques. Homogeneous techniques avoid clumping since excessive magnetic forces over time are not necessary. Homogeneous separation processes provide the same magnetic force everywhere in the vessel, thus exposing beads to gentler conditions over shorter periods of time. These techniques provide the end user with much higher lot-to-lot consistencies due to the lack of damaged and irreversibly aggregated beads. Why is magnetic bead resuspension important?